Our PA Trailers are unique; they are complete public address systems on wheels. 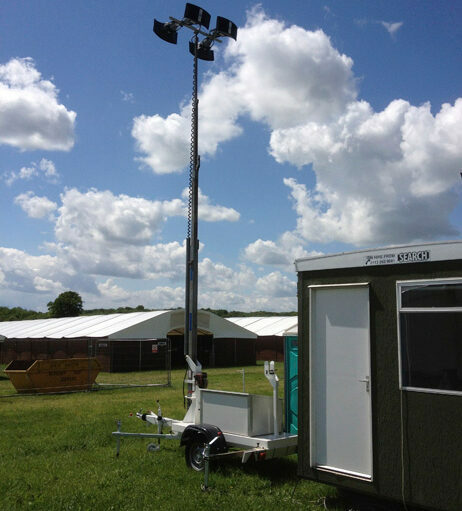 PA Trailer 1 has a 27-foot telescopic mast, onto which are attached 4 horn-type loudspeakers that can be angled to suit the specific location. At the bottom of the mast lies a battery-powered amplifier, a microphone with an extra long lead for announcer mobility, a CD player and iPod/phone input. A wireless hand-held radio microphone can be hired at additional cost. All of this equipment is self-contained in a weatherproof storage compartment. This system is ideal for fêtes, sports days, fun days, or any medium-sized outdoor event. It can also be used for flood lighting or as an aerial mast for a two-way radio repeater, or even as a part of a larger public address system. This trailer can be delivered and installed by our engineers or, if you would prefer to save on delivery costs, it can be collected by any reasonably sized car with a tow bar.